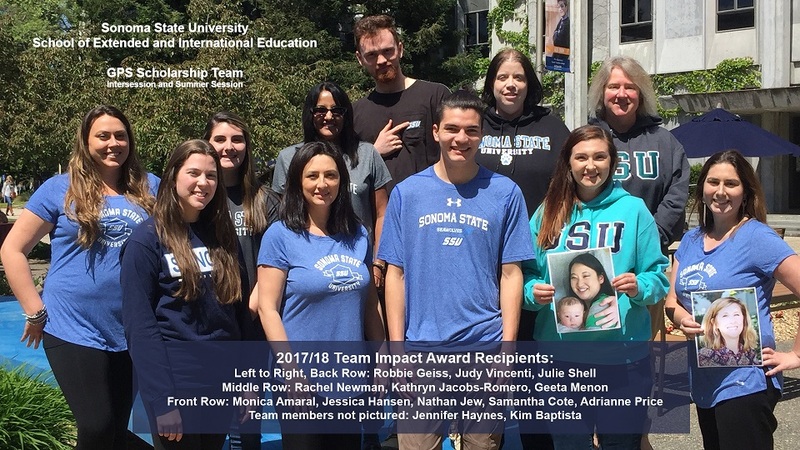 This team was nominated for working together and going far beyond the boundaries of their jobs in developing a new scholarship program that has provided immediate and significant benefit to SSU students. To do this, they worked across academic and administrative units, analyzed proper methods for needs-based scholarship awards, effective marketing campaigns, creative outreach and participation in public events where students could learn about the program. They did something that will have a lasting impact and that wasn’t required of them – they saw the need themselves and knew that cost was a barrier for many students participating in Winter/Summer Intersession. Rather than just acknowledging that need, they took action. Last Winter Intersession, SSU received 349 scholarship applications and awarded 198. For Summer Session 2017, they received 329 scholarship applications and awarded 200 to all students who qualified.